Save time, effort and money. Practice happy. Empower your practice in Australia. Simplify and speed up your admin processes. Our growing range of online add-ons can automate time consuming data entry. No downloads. No installation. All you need is a web browser. Coreplus is cloud software. Unlimited computers and mobile devices can access the software. You could save thousands of dollars by removing the need for complicated IT systems, servers, software management, and IT technicians. Explore how our pricing can work for you. Transition from your current PMS easily. We can import your data. Ask us how. 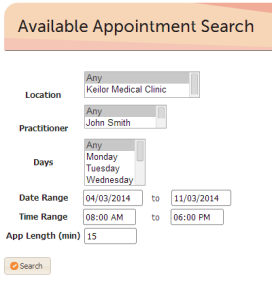 Easily create, edit, copy or reschedule an appointment for multiple practitioners. Don’t forget to mark and appointment as Attended, No Show or Cancelled for better appointment statistics. Group bookings are ideal for classes or family sessions where more than one client is attending. 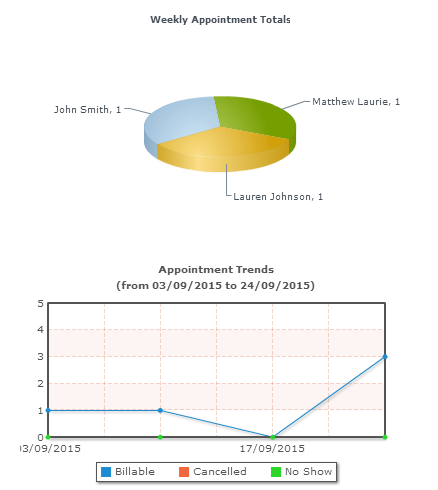 You can track different types of appointments by using colour coded appointment types. 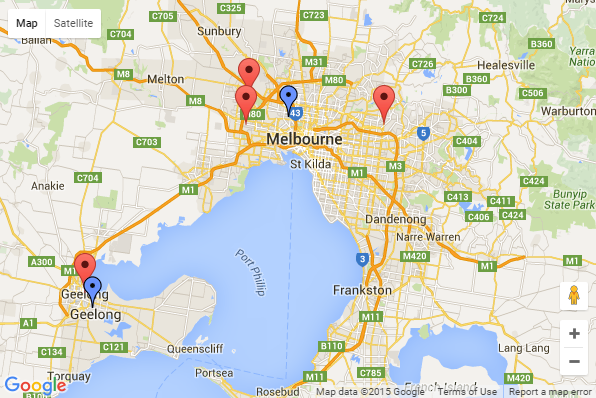 Track your time better by easily identifying the types of clients you are seeing. 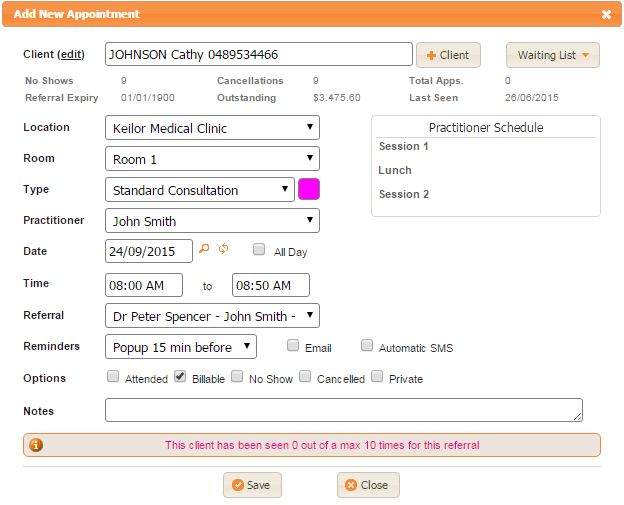 Create appointment limits so you can manage the number of session booked for a referral. Waiting lists help you carry out important health services to patients that are waiting for your next available appointment. This means you to get to see your patients when you are both next available. 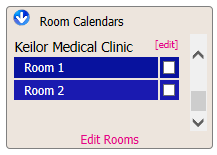 Easily make appointments in ‘Room View’ so you can better manage appointments and reduce any double bookings. Create schedules so your booking agent knows when your available. 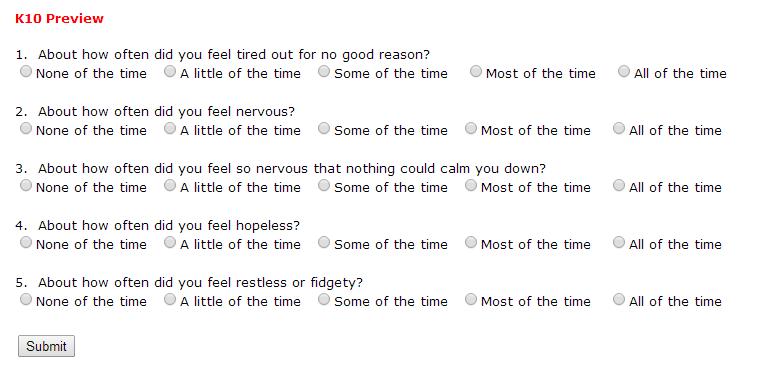 You can even specify the length of time and the type of appointments you prefer to take. Cancelled bookings cost your practice time and money however with SMS and email reminders, find out ahead of time so you can book in other patients. 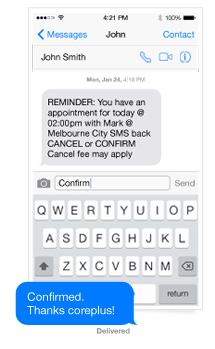 SMS reminders and confirmations can be setup to be sent out to patients days in advance of their appointment. 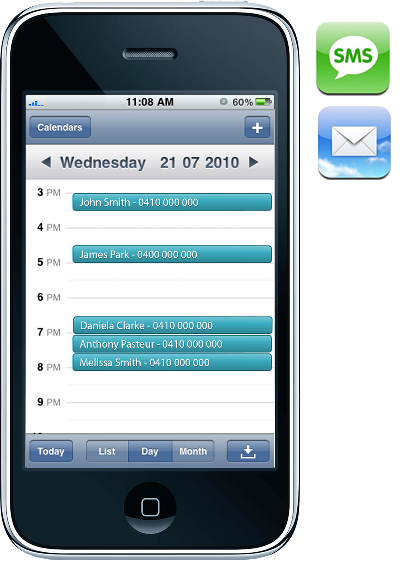 View your appointments on the go by syncing your coreplus calendar to your Apple or Android. iCal also allows you to sync your appointments from coreplus to your Google Calendar, Hotmail, Windows Live and Microsoft Outlook. Don’t know when you are next available, well coreplus can tell you. The Available appointment search allows you to search for your next available time and makes booking appointments fast and easy. 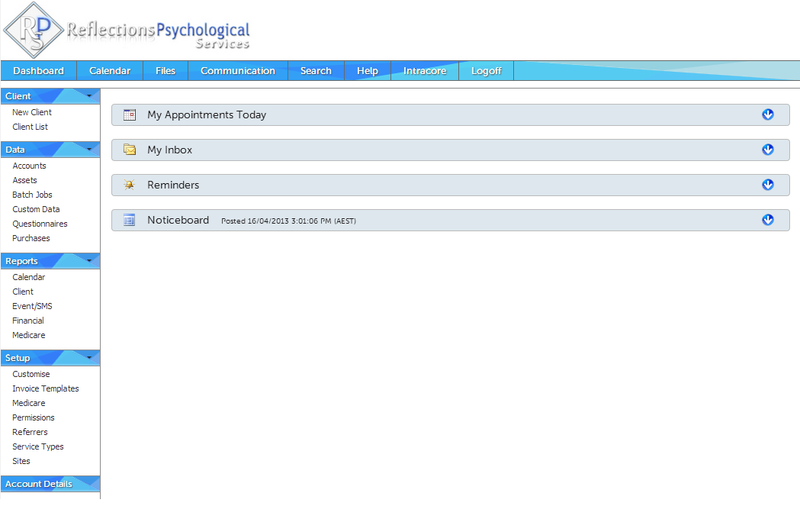 Some clients like to book appointments in advance, so coreplus allows you to easily create a recurring appointment. All your treatment and clinical notes can be stored easily online. In a client file you can keep a true history of all previous case notes with the name of the practitioner that saved the case note as well as the date and time it was saved. 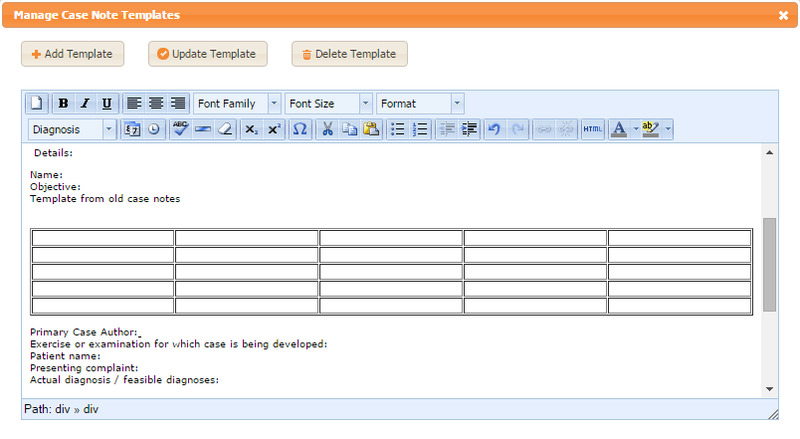 Create and use templates to quickly and easily complete your case note. You can create as many templates as you like. If your case notes are incomplete or still in progress, you can save and come back to the note at a different time to complete before saving. Upload an image of your own and utilise various drawing tools as desired to interpret a better outcome from the image. 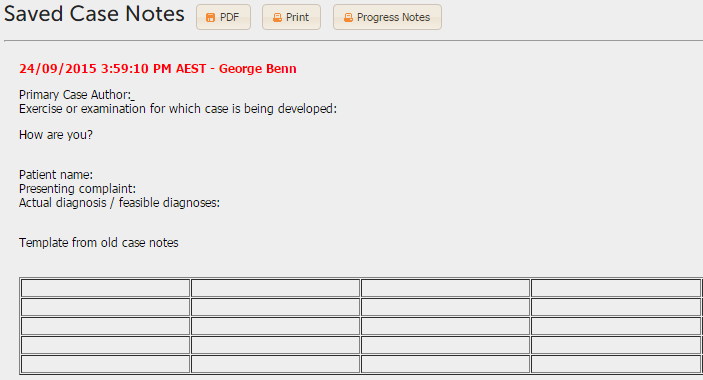 Enter a diagnosis summary, outcome and more. 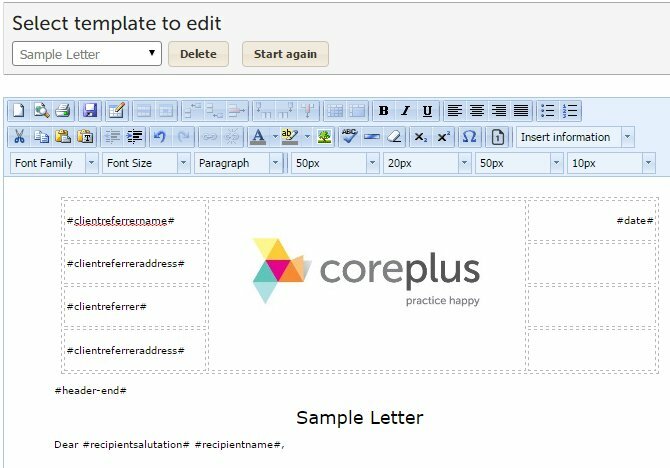 Creating a simple and professional letter in coreplus is easy. Add your letter head and create as many templates as you need. 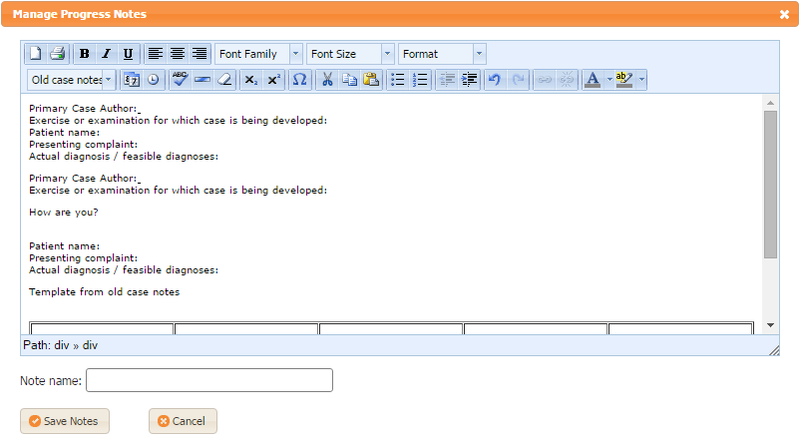 You can change font, edit letter margins and even add merge fields to insert details automatically in your letter. Stop re-writing or coping and pasting repetitive information in your letter. Add a merge field where data can be inserted automatically in a letter when you open the template in a client file. 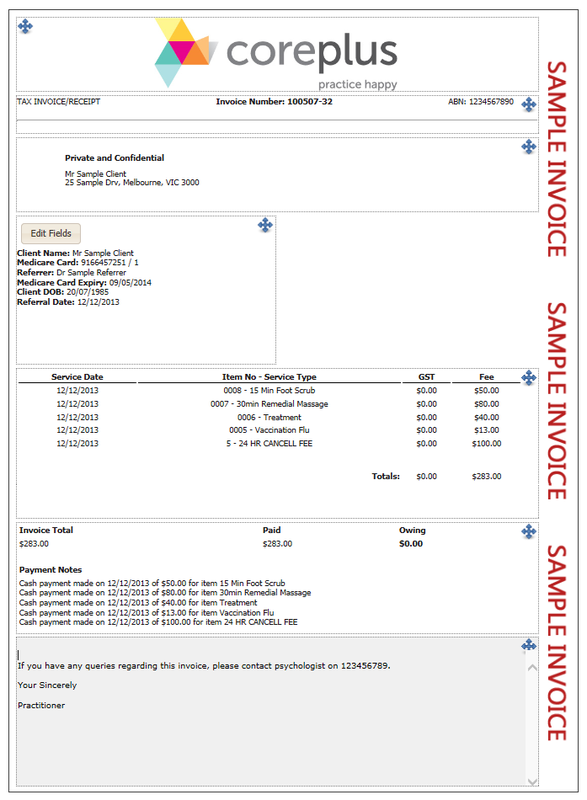 You can create an invoice and take payment straight from a clients appointment for quick & easy billing. Use our third party billing to invoice insurers and employers. Make invoicing even easier by adding all your special packages. Submit your Medicare & DVA claims online with coreplus. When creating an invoice, select the Medicare claim you want to process, it’s that simple. Your daily bulk bill report will show you the claims you have processed and the total rebate you received for easy reconciliation. 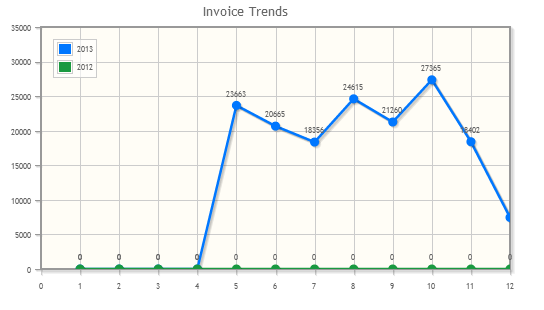 Creating Invoice templates makes third party billing faster because you can create as many templates as you like and select data from the clients invoice to appear on the invoice automatically. Batching invoice and payments makes third party billing even easier because with a click of a button you can send a batch of invoices to an insurer and make a batch payment. Access Calendar information in seconds with everything you need to improve your appointment trends. 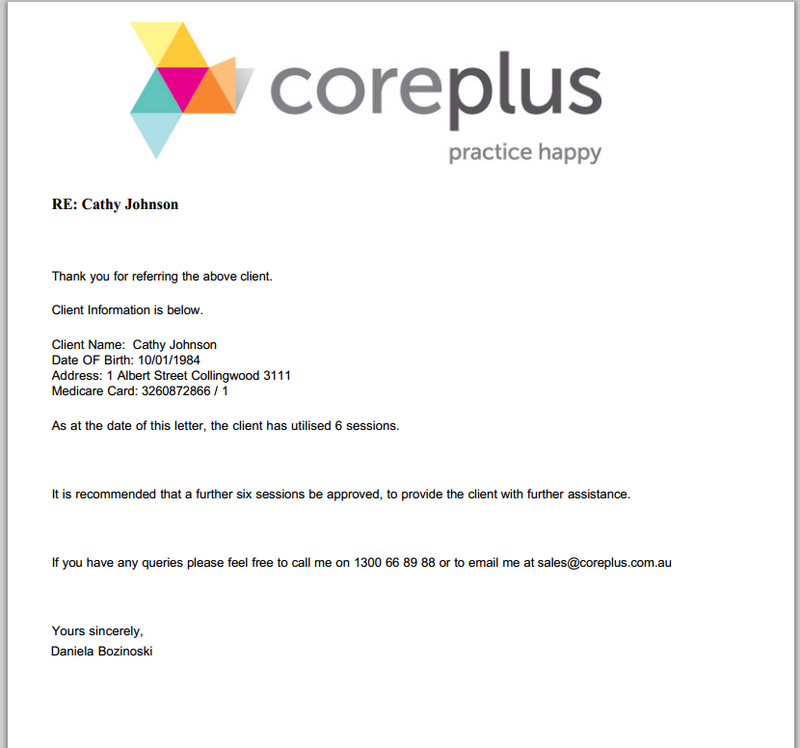 coreplus can show you booked appointment, appointment type and inactive client reports, as well as statistics about no shows, reschedules, cancelled and attended appointments separated by practitioner or groups. Want to know more about what areas your clients are from or what types or client presenting issues your dealing with? 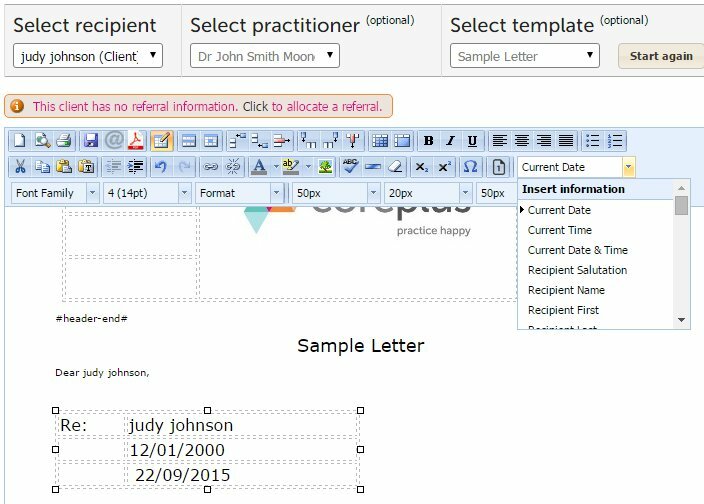 Expand your knowledge on your practice with residential, referrer, site, injury/illness reports and more which you can separate by practitioner, group and site. Do you know who your top 3 referrers are? 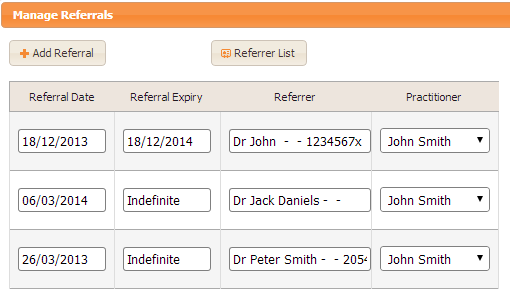 Build a better relationship with your referrers and watch your practice grow with referral reports. Want to know how much you have Invoiced and received? Want to break down reports by Practitioner, Site, Service Types or Group? coreplus provide you with easy to use financial and debtor reports with a click of a button. Client Referral Networks - Updated! Rehab Guru is a tool which helps therapists, coaches, athletes as well as health and medical professionals choose from more than 4,000 exercises to prescribe to their clients. Practitioners can use this exercise prescription software from their desktops, laptops or even their Android or iOS devices. The specialists at Rehab Guru invest deeply in product development in order to provide the ultimate prescription software, constantly gathering feedback and fine tuning. Streamlining a Health business does not have to represent a poor experience for patients. Rehab Guru is focused in creating the most complete product and providing simple tailored efficiencies for your business. Learn more about the coreplus + Physitrack integration. Learn more about the coreplus + Tyro integration. coreplus is integrated with Xero which is an easy to use online accounting software that’s designed specifically for small businesses. coreplus and Xero are both online, so you can access them anywhere, anytime. Just login via an internet browser with your PC, Mac or mobile. Your invoices and bank statements are automatically loaded into Xero, letting you match and manage your cashflow quickly and easily. 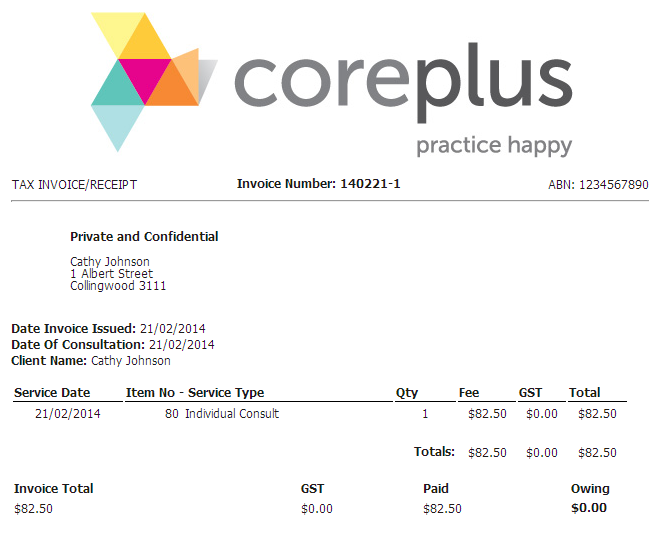 With coreplus to manage your practice day to day and Xero to manage finances – all your business needs are covered! Learn more about the coreplus and Xero add-on. 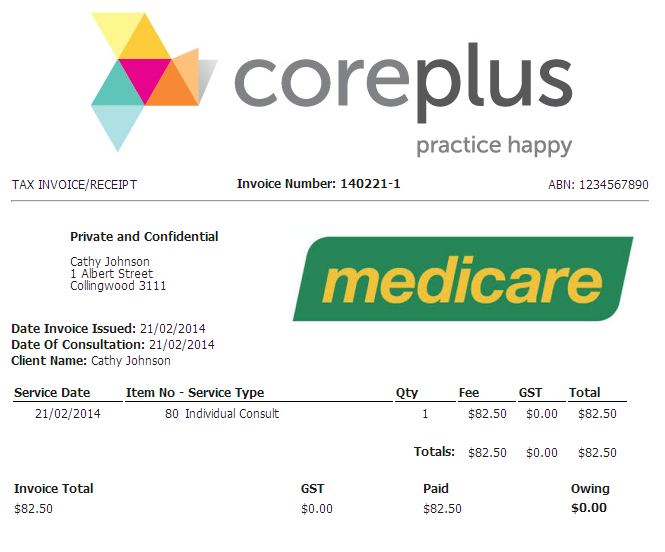 coreplus allows your practice to lodge Medicare and DVA claims fast and easy online. Costly EFTPOS terminals are not needed. Practices are able to claim Bulk Bill (BBC), Patient Claims (PCI), Gap Claims and DVA claims from anywhere, anytime. Medicare Online Claims are made as you are invoicing and responses from Medicare are received instantaneously. Learn more about our 100% Free Medicare Online Claiming. Not only will coreplus allow you to easily claim benefits in under 60 seconds, but as a Bulk Bill & DVA claim is processed by Medicare, you will automatically be emailed a list of all claims that have been approved and rejected. If a claim has been approved, coreplus will automatically reconcile this invoice for you. Learn more about our 100% Free DVA Online Claiming. Making healthcare more accessible and seamlessly connected; allowing convenience and loyalty to coexist. By harnessing the power of modern technology we’re creating a better healthcare experience for all. 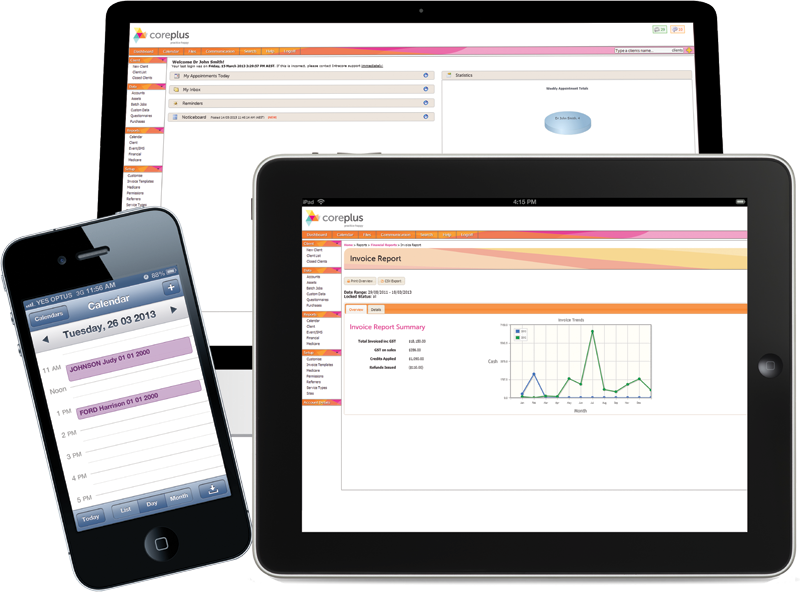 Learn more about HealthEngine integration. Anywhere Healthcare provides people in rural and remote areas with an alternative way of seeing a specialist. It’s a flexible option for people who often find it difficult to travel long distances for appointments. Learn more about anywhere healthcare. The Virtual Briefcase is Australia’s first purpose-built software system for psychologists, designed to provide clients, market and manage your entire private practice. An all-in-one business and marketing package that match your skills and books a new clients into your coreplus calendar. Learn more aboutThe Virtual Briefcase and their pricing. Secure Messaging supports the secure point-to-point delivery of healthcare messages to a single known receiving organisation. Message content is securely encrypted then delivered using standards set by the National E-Health Transition Authority (NEHTA), Standards Australia and secure messaging vendors. Argus has been successfully tested for conformance to NEHTA’s secure messaging specifications added on to coreplus and made available to you. Learn more about the coreplus SMD hub. Healthlink has been successfully tested for conformance to NEHTA’s secure messaging specifications added on to coreplus and made available to you. A free web based email & calendar service from Google. A free web based email & calendar service from Microsoft. 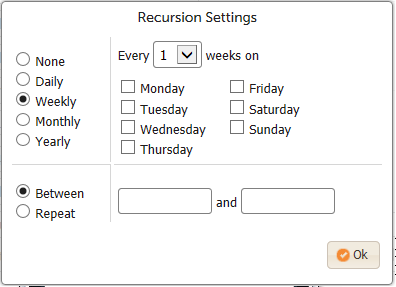 Connect any iCal-ready calendar service to coreplus. A free web based email service from Microsoft. 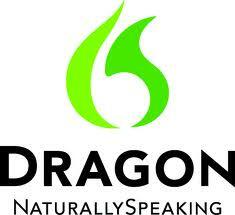 Dragon is a voice recognition software that allows you to speak directly into a microphone while reading some text and dictate notes into coreplus. Dragon Medical is highly accurate, understands medical terminology extremely well, and spells words correctly 100% of the time. Learn more about salesforce in healthcare. 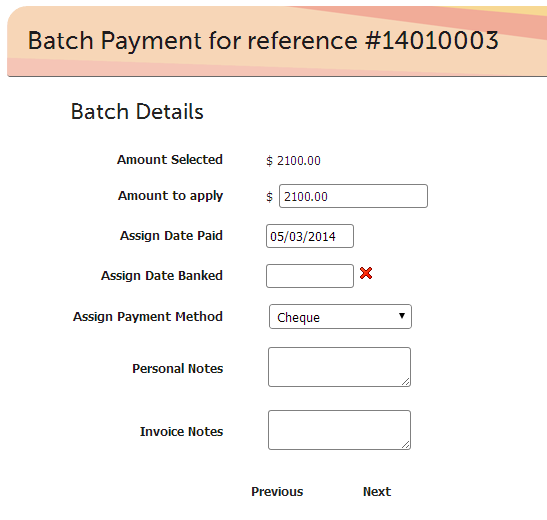 General ledger, real time bank feed reconciliation, BAS & Payroll made easy. 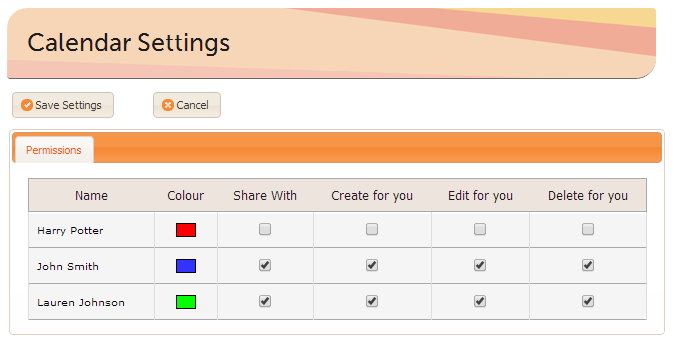 Upload your logo and change colour schemes so your coreplus account reflects your brand. If you have multiple referrals for one client, coreplus can help you manage each separate referral and there appointment limits. Create folders and upload documents and images to a client, personal or shared file. Create as many questionnaire templates as you like to track and measure client information quickly and easily. Reminders are free and allow you and your staff to make notes and set alerts about things to remember. Easily manage asset and equipment loan information and stock levels. Case Manager is suited for practitioners who are offering a service to clients. Supervisor is suited for Managers or people who require access to the whole of coreplus.